If you are dealing with old dog bad breath, it’s time to pick up the phone and make a vet appointment. Terrible dog breath means some sort of tooth or gum issue and possibly even pain, the extent of which can only be determined by your trusty vet. It seems to be a widely held belief that bad breath is normal, all part of being a dog. In fact it usually signals some kind of problem. The sooner you get him looked at, the sooner it will all be sorted. Treatment will, of course, depend on the cause. A course of antibiotics may be all that’s needed, or sedation for a thorough check up and a cleaning. Once he’s in your dog’s mouth and x rays have been taken, teeth may need to be pulled. Don’t worry, your vet will explain the scenarios to you. 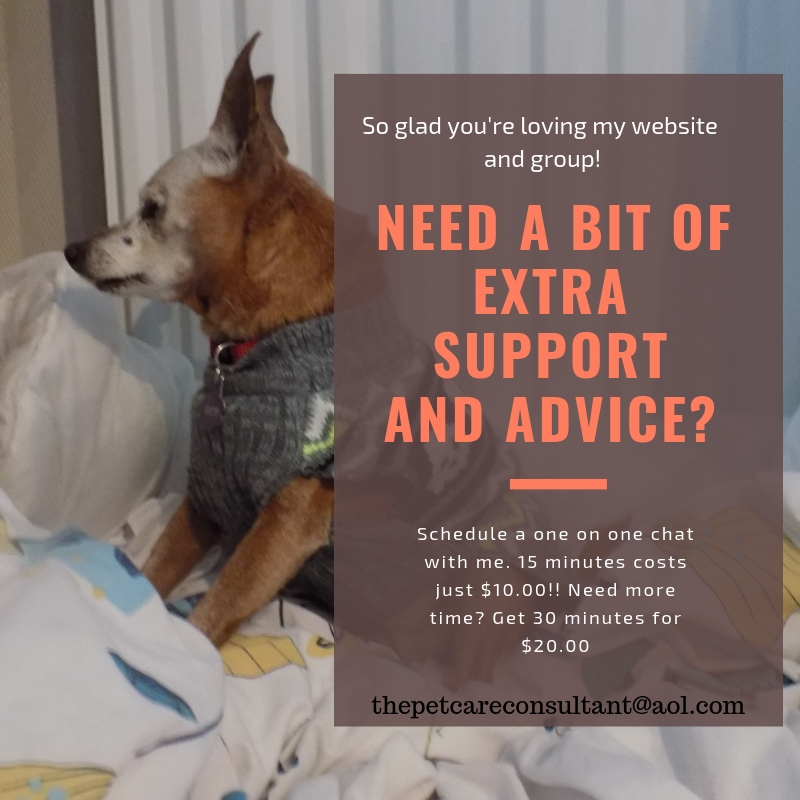 I know many senior pet parents worry about putting their dogs under anesthesia, so be sure to have a conversation with your vet about what is involved. Red had dental surgery a couple of times when she was over 13, and even with heart issues she was fine. There are anesthesia free options if you’re interested in going down that route, but do your research and be aware of any limitations there may be. For example, can a thorough enough cleaning be done on a dog that is awake. If bad breath is the result of your dog’s diet, a change may be recommended, and if tests reveal another reason, your vet will devise an appropriate treatment plan. Just like we keep our teeth and gums healthy with regular brushing and cleaning, the same can be done for our dogs. Luckily there are so many dog dental care products, you’re bound to find something that he is at least okay with. Brushing your dog’s teeth every day is ideal, but isn’t always realistic, which it certainly is not with our dogs. Even if you can only manage a couple of times a week, it is better than nothing. Toothbrushes come in a variety of sizes, and some even fit on your finger, while toothpaste comes in many flavours. If there’s no way you can use a toothbrush a dental wipe may work. How about toothpaste on a cotton pad? A liquid antiplaque solution is for adding to your dog’s drinking water, powders can be sprinkled onto food or sprays for the mouth. Hard chew toys, bones and dental chews will also help. Red has had some issues with her dental health over the years, ranging from a mild infection to dental surgery. We didn’t adopt her until she was 8, and her previous owners didn’t take the best care of her. Red is blind which is probably the biggest reason she kicks and screams if you go anywhere near her mouth. A toothbrush is out of the question, so the best I can do is tooth gel on a cotton pad a couple of times a week and Plaque Off added to her food once a day. I can’t get near Jack so Plaque Off and dental chews are the only things I can offer him. Hey, I search the internet for answers all the time, but in this case I have to advise you not to waste time doing that because you don’t yet know what’s going on. See your vet first for an answer, then research!! Make sure your vet takes a good look in your dog’s mouth as part of his regular checkups. Staying on top of oral health is a lot easier, and less expensive, then fixing problems. Does your dog let you brush his teeth? What is your dog’s dental care routine? Is he easygoing about it, or does he fight you all the way? Which products have you had the most success with? Sharing helps others so leave a comment below or on my senior dog Facebook page. I would like to invite you to join Senior Dog Care Club, my Facebook group for senior dog parents. There you will find lots of helpful tips and advice, a place to ask questions and share experiences. I look forward to welcoming you. I found this site because I was trying to help my sister find answers for her dogs bad breath. She has 2 dogs that are both still quite young (1 and 3 years old). Every time I visit with her I cringe when the dogs run up to me because of the way their breath smells. She told me that all dogs have bad breath and it is nothing to be worried about. Do you think I should tell her to take her dogs to the vet? I will share this site with her so she can read the information herself. Hi Simone, I’m certainly glad you found me. 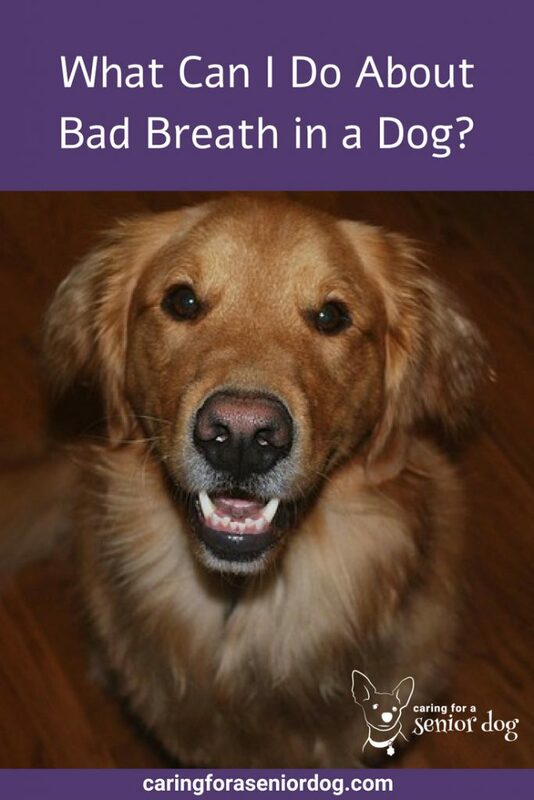 No, bad breath in dogs is not a given, and should definitely be checked out sooner, rather than later. For instance, if her dogs have periodontal disease, the bacteria can damage the liver. Better to be safe! Good luck, I hope her dogs are okay. Long time ago I had a dog when I use to live with my parents. Now things make more sense when I think about my dogs breath. It was temporary but still very noticeable. Now I know how to deal for the future when I get my own soon. I appreciate your comment. Certain things we assume are just part of the natural ageing process, but it seems like good news in your dog’s case if it was just temporary. Glad you find the information helpful for the future. It’s an eye-opener to know that bad breath in dogs isn’t always a given. By any chance, would a lack of water in the diet also have something to do with halitosis in dogs, the same way it sometimes does with humans? How much water should your dog lap up in a day, in case? Hi Sophie, thanks for your comment. The amount of water a dog should drink can be hard to quantify – it depends on size, age, activity level, but it’s thought around 1 oz of water per lb of weight. Of course drinking too little can lead to dehydration and organ failure which could absolutely affect a dog’s breath. My best advice is, if your dog’s breath is bad, see your vet. Also, if he seems to be drinking a lot of water, and conversely, barely any, see the vet. Any changes in the “normal” always warrants a check up. Hi Hindy, I enjoyed your post. I was told that dogs had the cleanest mouths. I guess I will not live by that adage anymore. We just lost a senior dog to kidney failure, she was a good dog. Hi Rob, I’m glad you enjoyed the post, thank you. I’m so sorry to hear about your dog. That’s always the worst part about sharing our lives with pets isn’t it? I’ve lost several pets to kidney failure, so every time one of my animals starts drinking and peeing too much, I get nervous. I really am sorry for your loss. I have two dogs. They are both hound dogs. We use the dental sticks on them. They do seem to help a bit. Do you recommend any particular brand? Hi Raphael, beautiful dogs! I will be writing a post about dental sticks, filled with pros and cons, and what to look for, as well as dental care for dogs. I personally prefer chews that are made from vegetables, or very basic, natural ingredients. I don’t buy the popular ones sold in supermarkets – I find there are too many ingredients that don’t agree with my dogs. My vets have always recommended Virbac CET chews, raw carrots can be given (as long as your vet says they’re okay for your dogs), and any toys they chew on are helpful. The best way to care for your dog’s teeth is regular brushing and dental checks. Hope this helped!! Thank you for taking the time to create this article so I can share it with my wife as we have two senior dogs that have some bad breath. We think of them as a part of the family and want to treat them as such. Brushing and taking care of your dogâ€™s dental hygiene is something I never thought was that big of a deal in dogs until after reading this article. Hi Carlton, thanks for taking the time to comment. I actually have 4 more posts about this issue coming out this month. Oral hygiene is definitely an overlooked issue in the care of dogs of any age, which is unfortunate because dental disease can cause serious illness, organ damage…. I hope you’ll find other posts useful as well. This is a really informative post about caring for your elderly dog. I have had many senior pooches to care for which is good in a way, because most of the dogs did live to a ripe old age. One of the most important areas of a dog’s health though, is definitely his teeth. If not cared for it can lead to life threatening diseases. One of my relative’s dogs had terrible breath but they didn’t want to take him to the vet because of his age. The dog died shortly after. According to the vet, his teeth were the death of him! Some dogs seem more prone to dental problems, especially the toy breeds like yorkies. This could have something to do with their diet? Many small breeds are fed a wet diet rather than kibble types. Thanks for sharing that Jose. I’m so happy the information helped and your dog is doing well. The wipes are a good idea, especially if your dog isn’t fond of you coming at him with a toothbrush!! What a great post, it’s so important to be on top of our dog’s dental health. I’m always in search for some breath fresheners for the Goldens and try to brush their teeth a few times a week. That’s great they let you brush their teeth! It’s interesting how many people are unaware of the importance of caring for their pets’ teeth, and the health issues that can arise as a result of poor oral hygiene. We’ve been trying to encourage tooth-brushing with the cats, so far Charlie is okay with it, Max with tolerate it, but the girls won’t have a bar of it. I’m persevering! So the girls are the troublemakers I see!! We adopted Ruby at about 8 and her teeth were already in pretty bad shape. We do brush almost everyday and she did have a dental last spring. I love that you adopted a senior. I bet she felt so much better after her cleaning, and you’re lucky she lets you brush her teeth. It’s a battle in this house! People very often think it is alright for their dogs to have bad breath. Most are ill informed about how oral hygiene is so important in their dogs and how ignoring it can have severe health repercussions. Thank you for creating awareness. I have to agree with you Malaika. Most people don’t realise the importance of proper oral hygiene, and how much it can impact overall health. It’s so amazing what the mouth can tell you about a dog’s health. My mom keeps her dog’s teeth cleaned on a regular basis. I believe it’s an often overlooked part of keeping dogs healthy. Your mom’s dog must feel great! Excellent post Hindy, & very thorough! Dental care is so important for dogs. Thank you Cathy. It is super important, and I’m hoping to make more and more people aware of that. Thanks Ruth. I’m with you on that one – easier for everyone than brushing! Glad it’s working so well. What kind of bones does Layla chew? It is just amazing how much influence a pet’s oral health has on the health of the rest of their body! A dirty mouth leads to so many painful problems. Thank you for the tips! My pleasure! 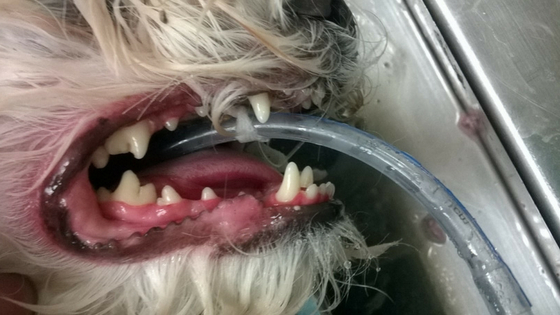 It is amazing, and sadly many people don’t realise the impact poor oral hygiene has on their dog’s health. Not to mention the pain they are often in. Our doxie is predisposed to terrible teeth and periodontal disease. Even after only six month from a cleaning, his breath starts to change so he’s been getting dentals annually for his entire life. I was just at a meeting earlier today and we were talking about a few rescues and how before their dentals their breath told us they needed cleanings! Good pics in your piece. Bad breath is definitely a good indicator of overall health. 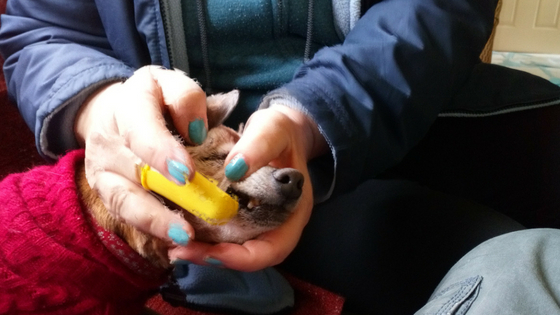 We take our dental care seriously, why not our dogs! Last year my 6 y/o bichon frise Delia’s mouth started smelling terribly. She has never tolerated tooth brushing and had no interest in chews in the past. After a dental exam she had to have several extracted. I still feel horrible that her mouth was in that bad of shape. Since the extractions she will chew dental chews and natural chews. Thankfully, I started my other dog Chewy with teeth brushing as soon as I adopted him at 8 mos. He’s great about it! Thank you for sharing these tips! Red’s the same way – she’s a small little dog but you can’t get near her. They definitely feel better after a dental. It’s definitely helpful if you’re able to start young, but starting is the key no matter what age. Hopefully people will start catching on to canine oral hygiene. I feel like Gracie’a teeth look bad, but then I see pictures of dogs with these yellowish brown teeth that look awful. It makes Gracie’s light yellow spots look better! I’ve become really serious about her dental care since I’ve started noticing the yellow. I’m sure a lot of us could become more serious about dental care. I’m sure Gracie is very happy about that! My dogs don’t like to have their teeth brushed. They love their dental chews and don’t mind a water additive, though. One of the dogs (age 7) had a broken tooth and needed to have it pulled, and her breath is so much better now. They’ll never turn their noses up at chews will they? I can’t get near my dogs’ mouths to brush their teeth. Red is a small little girl, but when she clamps those jaws shut, forget it. Even my vet can’t do it without help. We brush Mr. N’s teeth every day and he had a dental last year. Small dogs tend to have bad teeth! Mr. N is lucky you’re so on top of his dental care, and the fact that he’s so cooperative doesn’t hurt. It’s shocking how dental health affects the whole body! I also brush my dog’s teeth if I notice they’re not smelling fresh, I wonder if they like having a clean mouth. Hi Lindsay, it is surprising and too few people realise it. I’m assuming they’re as happy as we are!! 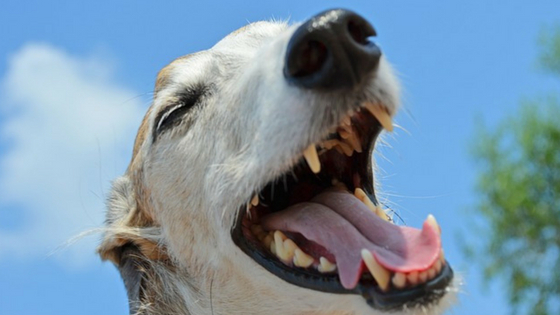 Stinky breath in dogs is not normal and always needs to be addressed. Oral disease is the main reason but there also can be foreign bodies, growths, or systemic problems outside the mouth. Couldn’t agree with you more Jana. My dogs (the corgis) have good teeth (so says their vet) at 7 years old and I’m thankful for that. But whenever one of them has significant bad breath, I always worry that something in their mouth has gone awry. So true about chronic bad breath being a bad sign. My little rescue chihuahua is missing almost all her teeth at 10 years old, and I’m sure it could have been prevented. Thankfully, she manages just fine without them. Poor little Chi, sounds like neglect by her previous guardians. Amazing how adaptable they are. It’s great your corgis have such great teeth – I would love to be able to avoid the cost of a dental. Thanks for writing this. My Puggle suffers from bad breath & know it’s due to her previous owners didn’t keep up on her dental health. I’ve been struggling with DIY options due to not wanting to put her under anesthesia. Learning there are dental cleanings available while they are awake is wonderful news. I do have to say that if your dog already has bad breath the DIY options won’t help. It’s important to have her checked on by a vet so you can get a better idea of any dental issues she may be experiencing. Of course I understand the hesitation of anesthesia but my dog had a dental cleaning when she was around 15 and had a few issues including a heart murmur. My vet and I decided the risk of doing nothing was far greater than the surgery. You definitely have to trust your vet to feel comfortable going down that road. Once the surgery is over than the cleaning options will help. Hi Ava, if your dog has such bad breath there’s a good chance he’s in pain and needs a cleaning. I highly recommend you make a vet appointment sooner rather than later. Good luck! Wow 10 cats, you do have your hands full!! There are dental wipes available or I used to wrap a cotton pad around my finger, put a little toothpaste on it and I found it a bit easier than a brush. Dental health is super important and poor oral hygiene can lead to lots of problems down the road. This all holds true for cats too. I used to be one of those that thought bad breath was normal for both cats and dogs, but I’m glad I learned otherwise! When my cats’ breath starts stinking, to the vet they go! Absolutely it’s true for cats as well!